The ACW Story: Your American Civil War newsletter. Keeping you in touch with the history of the American Civil War. If this newsletter is not displaying correctly, or if you can’t see the pictures, click here to view The ACW Story in your web browser. We are going to try to stick to a consistent format for these newsletters. They should look something like this: a famous quote, some American civil war information (article, facts, etc. ), a trivia question, and a, what’s new on the site, section. We will try to relate the major parts of the newsletter to a single theme (this month it’s the Battle of Fort Sumter), and we may add in more sections when we think they might provide value. So that’s pretty much it, please enjoy the first issue of The ACW Story! If you enjoy the newsletter, please consider sharing it with a friend. If you haven’t already subscribed, you can do that by going here. "I have the honor to acknowledge the receipt of your communication, demanding the evacuation of this fort, and to say in reply thereto, that it is a demand with which I regret that my sense of honor and of my obligation to my Government prevent my compliance." This was Major Anderson's response to General Beauregard's request that he surrender Fort Sumter. 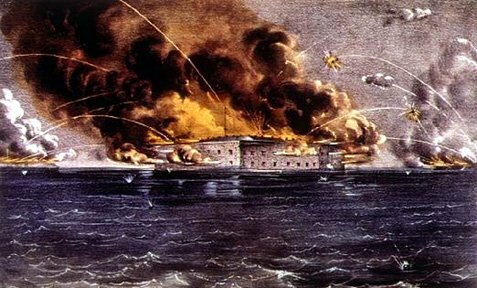 One of our new articles this past month was about the Battle of Fort Sumter (above). This small and seemingly minor battle was the tipping point that brought on the next four years of violence and bloodshed. "... at twenty-five minutes past four o'clock, A. M., the circle of batteries with which the grim fortress of Fort Sumter is beleaguered opened fire. The outline of this great volcanic crater was illuminated with a line of twinkling lights; the clustering shells illuminated the sky above it; the balls clattered thick as hail upon its sides ..."
" The firing now began in good earnest. The curling white smoke hung above the angry pieces of friend and foe, and the jarring boom rolled at regular intervals on the anxious car. The atmosphere was charged with the smell of villainous saltpetre, and as if in sympathy with the melancholy scene, the sky was covered with heavy clouds, and everything wore a sombre aspect ." Trivia Question of the Month! What part of Major Robert Anderson’s wardrobe was used to make powder cartridges during the Battle of Fort Sumter? Hint: check out this Fort Sumter Facts article I wrote for Ezine Articles for the answer. Give your answer by replying to this question on our Facebook page. All correct answers get to give themselves a pat on the back! What else is new on the website? History of Taps – The history of taps is riddled with interesting stories, some more true than others... Here we take a look at where the iconic tune really comes from. Emancipation Proclamation – Most people believe that the Emancipation Proclamation was simply a document which freed the slaves, but there is so much more to it than that. This article includes ten interesting facts surrounding the Emancipation Proclamation, and the full text of both the preliminary and final proclamation. List of Civil War Battles – This is a list of over 370 civil war battles. It includes dates, locations, victors, and some additional information that might be of interest on some of the battles. Feel free to suggest additions to this list. See new and updated articles anytime by going to our blog. Thanks for reading The ACW Story from American Civil War Story. Subscribe to The ACW Story by clicking here.